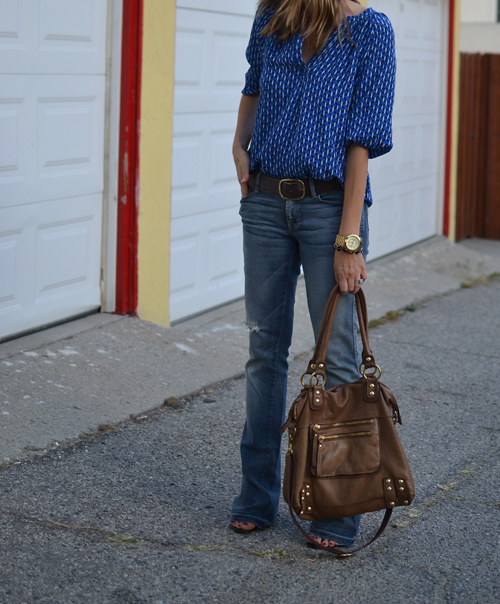 I've always loved the look of a flowy blouse paired with a slim fitting pair jeans or pants. It's a versatile look that's classically feminine and easy to achieve no matter what your budget is. Instead of wearing my blouse untucked, I decided to tuck it in and pair it my "wear-with-everything" belt. It elevated my overall look while still being casually chic at the same time. Perfect printed blouse - love this color on you! You look fabulous and love the idea of tucking in the silk blouse! That blouse is perfect and really versatile. Loved it. Love flowy blouses on you! Love your soft waves, so pretty! The print is wonderful! I love wearing blouses a bit baggy so I can tuck them a bit. So comfy and chic!